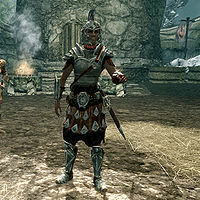 The Imperial Captain is a warrior and one of the first people you meet in the game. She is in charge of the Imperial Legion soldiers stationed at Helgen and orders your execution during the tutorial. If you choose to follow the Stormcloak Ralof into Helgen Keep, she will become hostile (see Unbound). If you choose to follow Hadvar into the keep, the captain will not be seen again. She uses an Imperial sword in combat, and also carries an iron dagger. She wears a full set of Imperial heavy armor: Imperial armor, Imperial boots, Imperial bracers, and Imperial officer's helmet. This is the first full set of heavy armor you can obtain in the game. When the carts stop at the execution area, she may say, "Get these prisoners out of the carts. Move it!" After the prisoners have exited the cart, she will say, "Step towards the block when we call your name. One at a time." When Lokir attempts to escape, she will call out "Halt!" and then, "Archers!" causing them to kill Lokir. After this scene, she will ask, "Anyone else feel like running?" When Hadvar notes that your name is not on the list of those to be executed, she dismisses his concern by saying "Forget the list! He/She goes to the block." General Tullius: "It's nothing. Carry on." Imperial Captain: "Yes, General Tullius." She will then turn to the Priestess of Arkay, and say, "Give them their last rites." When calling for you to be executed, the Imperial captain refers to you depending on your race. Dark Elf "Next, the dark elf!" High Elf "Next, the high elf!" Imperial "Next, the renegade from Cyrodiil!" Nord "Next, the Nord in the rags!" Wood Elf "Next, the wood elf!" Hadvar: "There it is again. Did you hear that?" Imperial Captain: "I said, next prisoner!" When Alduin finally swoops down upon Helgen, she will ask, "Sentries! What do you see?" If you choose to enter the keep with Ralof, after you pick up Gunjar's gear, she will approach from the other room with an Imperial soldier and you will overhear her say, "Come on soldier! Keep moving!" She will then command, "Get this gate open." When she sees you and Ralof she will shout, "It's the escaped prisoners!" You will then be forced to kill her. If you go with Hadvar instead, she is never seen again in the game. This page was last modified on 3 June 2016, at 00:12.